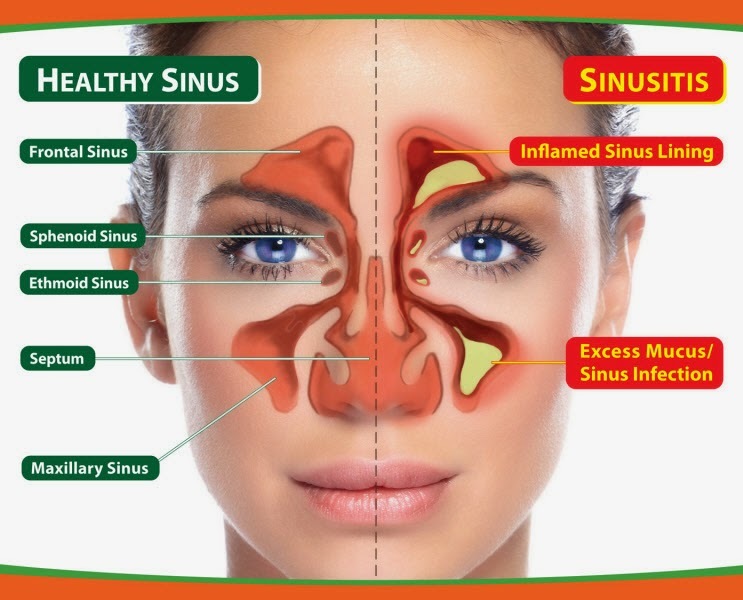 sinusitis is a transient inflammation of the lining of the nasal sinuses (hollow space or cavities) mostly due to the infection of the upper respiratory tract is termed sinusitis. Some people also have dry coughs and find it hard to sleep. Others have upset stomachs or feel nauseous. · Colds and flu are spread primarily when an infected person coughs or sneezes near someone else. · A very common method for transmitting a cold is by shaking hands. · Everyone should always wash their hands before eating and after going outside. Ordinary soap is sufficient. · Antibacterial soaps add little protection, particularly against viruses. · Wiping surfaces with a solution that contains one part bleach to 10 parts water is very effective in killing viruses. If you have acute sinusitis, you should use over-the-counter( please note self medication is highly injuries to health) or prescription decongestant nose drops and sprays only for few days. If you use these medicines for longer periods, they can lead to even more congestion and swelling of your nasal passages. If you have an allergic disease along with sinusitis, you may also need medicine to control allergies. Symptomatic Homeopathy medicines help to increase the immune power to act against recurrent infections and allergy. Symptomatic Homeo medicines act well in sinusitis without any side effect.